SPLIT brings together works by six internationally based artists whose work shifts between the realms of two and three-dimensional representation. 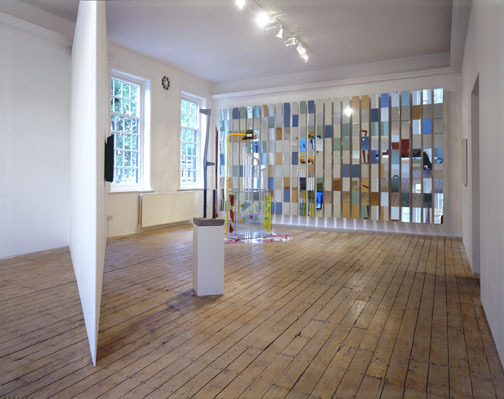 Including painting, drawing, sculpture and video, the works share a common fascination across the different mediums for abstraction, surface, colour and material and the dynamic relationship between them. Haluk Akakce studied as an architect and the interest in light and space is still prevalent in his digitally animated videos. ‘Mr Butterfly’ appears almost as if a modernist abstract painting was breaking down and re-inventing itself before ones eyes; constantly moving and folding in on itself. Los Angeles based painter Brett Cody Rogers takes buildings and landscape imagery as his subject matter deploying a technique of dry brush smears and scrapes that doubles as a mode of architectural rendering. From his day-glow palette spaces emerge and merge back into the picture plain. Reyles work functions within a constant, shifting dialogue between his sculpture and paintings. He deploys scrunched foil to the surface of his paintings, creating a reflective surface that seems to have grown out and off the pictorial format into the Perspex frame that encases it. ‘Monumento al Partijiano’ takes its form from an original sculpture by Consagra Pietro which Reyle saw in a museum in Rome, the mirrored elements sit upon a plinth somewhere between complete abstraction and figurative possibility. Gary Webb’s sculptures also hover between representation and abstraction. Combining the vocabulary of modernist sculpture with a pop culture vernacular Webb creates his own language of abstraction. 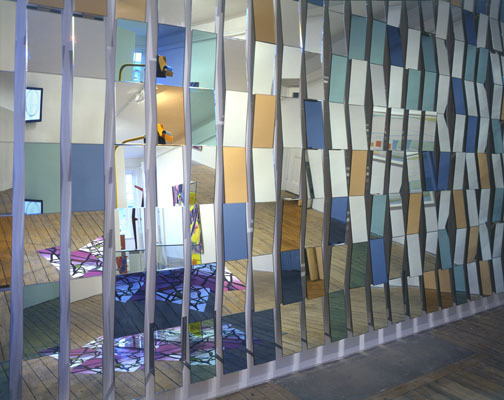 His wall of geometrically placed mirrors are tilted in different directions, covering the two-dimensional plane as well as capturing and fragmenting the surroundings. Thomas Scheibitz paintings break down landscapes, still life, and architecture by use of straight lines, filled in spaces and overlapping geometric shapes What may seem at first as formal flat renditions soon open up. But there are layers of abstraction; the figurative elements in his paintings are themselves representations of representations, having been adapted from an archive of media clippings the artist is continuously collecting. 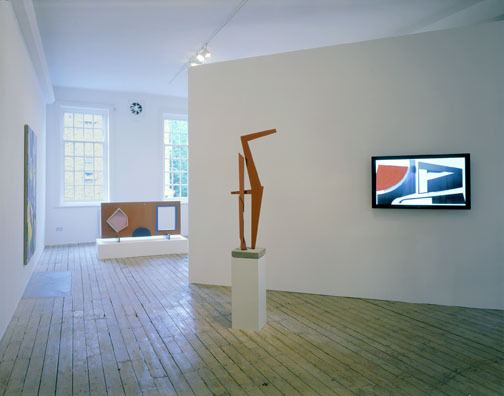 Here he presents a sculpture that is essentially a three-dimensional extensions of the paintings’ interlocking systems of flattening and distorting. Patrick Hill’s lyrical sculptures gracefully suggest worlds beyond themselves. Personal and autobiographical concerns are encoded within a shifting perceptual framework of balance, weight, gravity, opacity, translucency and colour. Small shifts can be visceral, creating a highly charged dynamic out of successive moments in time. In works fashioned from both fragile and rough materials (glass, cloth, wood, rocks and ribbon), narratives and memorials emerge out of what is seemingly non-representational. The works in the show are intrinsically involved with the architectural space they inhabit, and in finding creative ways of transcending the limitations that a medium presents. They have taken the legacy of Robert Morris’s mirrored cubes and split them into fragmented possibilities. The ‘split’ is a crack in the representational surface, embedded with the potential of movement and transformation.